Savers who have cashed in their pensions under new freedoms are losing up to £13,000 in rip-off fees. About 100,000 savers are at risk of ‘complex and opaque’ charges levied by insurers when they begin to withdraw money from their pensions, a report by the City watchdog found. In the worst cases, customers are being stung with up to 44 separate charges, the Financial Conduct Authority found. It said some pensioners were overpaying by as much as £650 a year on a £100,000 pension pot – or £13,000 over a two-decade retirement. On top of this, the watchdog warned that 50,000 savers are missing out on a third of their potential retirement income – or about £1,500 a year – because their money has been moved into a poor-value cash fund that pays little or no interest. Savers are to be given a ‘pensions passport’ to help them get the best income possible in retirement. In a major victory for Money Mail, the City watchdog wants savers to be handed a simple statement on one sheet of paper outlining how much they will receive when they retire, what type of pension scheme they have and where their money is held. It would mark a huge improvement from the reams of paperwork savers have traditionally been given, leaving many so bewildered by the jargon that they have struggled to shop around for the best deals. The new pensions passport would be sent to customers from the age of 50, the Financial Conduct Authority (FCA) said. 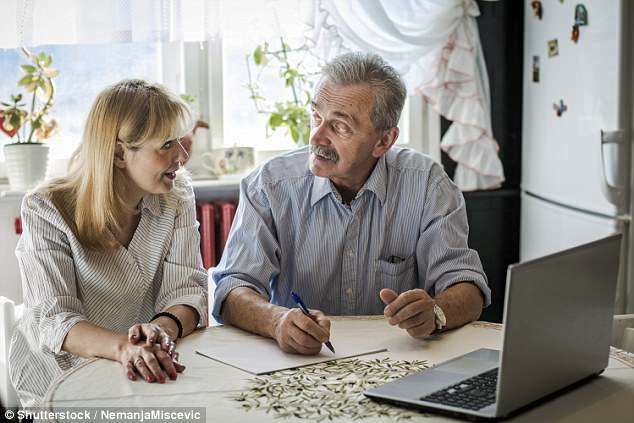 The plans, outlined by the FCA yesterday, come after a campaign by Money Mail for to simplify the complex information sent to savers about their pensions. As well as laying out exactly where a customer’s money is held, the document will detail whether their pension includes any valuable guarantees. Currently, some savers retire unaware that they are entitled to extra cash thanks to perks buried in the small print of their contracts. The pensions passport document will also remind savers they are entitled to free help from the Government’s Pensions Wise Service. Savers will then be sent information about their pension and their options every five years until they take their pensions. To boost their income, they would need to invest in funds linked to the stock market. Experts say this type of investment is often more appropriate for someone entering a typical 20-year retirement. The FCA yesterday announced plans for tough rules to protect customers falling victim to the retirement rip-offs. The crackdown could include a cap on fees; forcing insurers to spell out charges in pounds and pence, and banning them from automatically moving customers into poor-value cash funds in retirement. It marks a victory for Money Mail, which has campaigned for fairer charges on so-called drawdown pensions, and whose investigation first revealed last year that customers were having £13,000 gobbled up by expensive investments. Campaigner and former pensions minister Baroness Ros Altmann said: ‘I am really pleased the FCA is taking action. All the problems that have plagued pensions for many years are now emerging in the drawdown market. Christopher Woolard, of the FCA, said: ‘We know that the choices introduced by the pension freedoms have been popular with many consumers. However, they are now required to make more complicated decisions than ever before. Huw Evans, director-general of the Association of British Insurers, described the FCA’s plans as a ‘common sense approach’.